2016 Cox Plate betting | bonus & tips | is Winx value for money? 2016 Cox Plate bookie bonuses & free punting tips: will Winx win? Racing Online - Tips - 2016 Cox Plate bookie bonuses & free punting tips: will Winx win? IS there a better day on the punt than Cox Plate day? We don’t think so and the 10-race card at Moonee Valley this Saturday is an absolute ripper. The $3 million Group 1 Cox Plate runs at 5pm where the Winx vs. Hartnell battle will finally take place, but punters have backed a few at odds which includes talented three-year-old Yankee Rose and French invader Vadamos. The Fillies Classic will also be a highly-competitive race and the Crystal Mile features a top Melbourne Cup fancy which punters will be keeping a close eye on. The Melbourne Cup form continues with the Moonee Valley Cup which features the likes of Gallante, Who Shot Thebarman and Excess Knowledge which all have eyes on the November 1st prize, but Saturday is all about the Cox Plate and one horse in particular. Winx is the the defending champion and it hasn’t put a foot wrong since winning this time last year. The great mare is out to prove why it’s the best horse on the planet and punters are getting some great value. 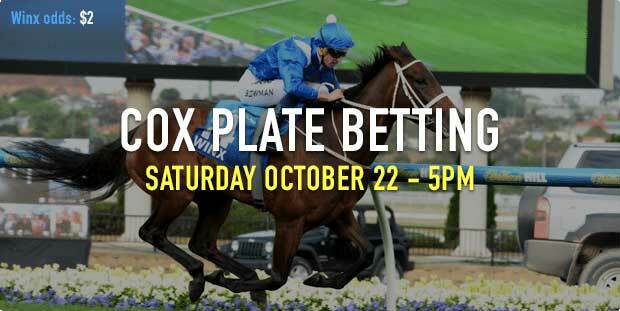 Start your Cox Plate day by taking advantage of CrownBet’s bonus offer. Run second or third in the first five races at Moonee Valley and CrownBet will match your stake with a bonus bet. Chris Waller lines up debut winner Luiza which scored in a quick time at Randwick. The two-year-old ran 56.75 for the 1000m which is slick, but it won’t have all favours from barrier 11 here. The inexperience of the majority of runners will help its cause and having Bowman riding helps, but the $3.40 is getting short. Pure Emotion is on debut before Clinton McDonald and it’s bred for speed. The Exceed And Excel filly has been specked at each way odds which suggests a good debut run is expected. It opened at $6 and has dropped to $5.50, so watch the betting for any positive line movement. Miss Wahoo ran on well in the Debutante Stakes at Caulfield and the race experience will help. The Tony McEvoy-trained filly ran 57.50 for the 1000m which is a good time and it has drawn well enough to feature in barrier four. McEvoy is riding in great form and it shouldn’t be overlooked at $9.50. Felines is coming off a strong win at Randwick and it’s a seven-time winner at the 1000m. This is slightly shorter, but that won’t be an issue and having Hugh Bowman in the saddle from barrier one will give it every chance to win. It loves rain-affected tracks and the $5.50 on offer looks like a good price. Gun Case is a seven-time winner which scored impressively last start on this track where it is unbeaten in two starts. The Darren Weir-trained gelding will have to cope with the wide barrier draw of 13, but it is an adaptable type which has a great racing record. Has been well supported at $4.40. Diamond Oasis is currently paying $8.50 after opening at $9.50 and despite doing a lot of travelling this season, it could surprise in this. The Weir-trained gelding has been to Sydney, Melbourne and Adelaide in 2016 and although it hasn’t been in winning form, it hasn’t been too far away and could pose a threat to these. My Country was game in defeat last start behind Hear The Chant and it will have to show those fighting qualities again after drawing barrier 16. Tactics will be important here, but it will likely have to sit three-wide just off the pace. That will make it tough to gather momentum, but it shouldn’t be ruled out at odds of $6.50. Sweet Sherry is the current $5.50 favourite in an open field despite drawing barrier 18. The Corstens-trained filly flashed home late last start in the Atlantic Jewel Stakes and it has the ability to sit off the pace and run home. It will likely drop back from the draw and produce late. Modern Wonder was stylish late when finishing third behind Hear The Chant last start. The three-year-old was wide throughout, but stuck on gamely which suggested the 1200m was right up its alley. It has drawn well in barrier seven and $6.50 is a nice each way quote. John O’Shea lines up Archives which didn’t run well in the Guineas Prelude, but its form prior was solid. The three-year-old won the Hampden Stakes at Doomben before running second in the Danehill Stakes at Flemington. The form out of that race is strong and the drop back in distance might be its go. $3.40 with bookmakers. Ken’s Dream didn’t get much luck in the Blue Sapphire Stakes last start after being caught wide of eventual winner Flying Artie which caused interference. The Weir-trained colt looked impressive prior with back-to-back wins to start its career and it has come accustomed to racing at The Valley. Current favourite at $3.20. Dalradian produced its best run in some time when second in the Blue Sapphire Stakes. The Weir-trained colt is a past winner at Moonee Valley and it might try the same tactics of leading from the wide barrier. It opened at $6.50 and dropped to $6 which is getting slightly too short for our liking. Rocket Commander has consistent form with a last start placing at Caulfield behind Euro Angel. The Matthew Dale-trained mare has form on slow-heavy tracks with three wins and seven placings, so consider here at an each way price of $9.50. Lady Le Fay finished off well behind Dixie Blossoms in the Angst Stakes at Randwick and it produced solid work behind Winx during the week. The six-year-old is a three-time winner at this distance and gets Hugh Bowman in the saddle. It could be looking for more distance later in the campaign, but it has been well backed at $2.60 in this. Metaphorical has been kept safe in the betting at $7. The Hayes/Dabernig-trained mare finished third in the Sunline Stakes on this track in March and it hasn’t been far away from a win since. It flashed home behind Don’t Doubt Mamma in the Let’s Elope so consider against this opposition. Sezanne got a little too far back at Randwick in the Flight Stakes, but it worked home well enough to finish third. The Waller-trained filly will likely have to drop back from barrier 15 which is a concern at Moonee Valley, but if it gets a drag into the race it could be tough to beat. Currently on the second line of betting at $3.60. Exocet had no luck last start in the Edward Manifold Stakes when it was shut out at the 300m mark. The three-year-old looked good winning its two prior starts and having Dwayne Dunn riding should ensure if gets a nice trip in transit. It’s well over the odds at $10 and each way punters will likely back it in. I Am A Star has been backed in from $3.50 to $2.90 and deservedly so after its second placing in the Group 1 Thousand Guineas. The Shane Nichols-trained filly has very good form in behind the likes of Foxplay and Legless Veuve and it must be considered here. The United States is a quality runner which didn’t get a lot of luck in behind Awesome Rock in the Dato Tan Chin Nam Stakes. The seven-year-old was a runner-up in the Queen Elizabeth and it won the Ranvet prior to that by beating Hauraki. It’s a serious threat here and the $3.40 seems generous. He Or She was no match for Winx and Black Heart Bart in the Caulfield Stakes, but its form prior when second in the Underwood is a better guide. The Hayes/Dabernig-trained gelding has yet to win in four starts this campaign, but it has been building nicely towards this and the mile suits. $4.60 is a good price on offer. Royal Rapture’s winning streak came to an end last start when fourth in the Toorak Handicap, but it wasn’t disgraced and there’s no reason it can’t run well again. The seven-year-old is a 15-time winner and Darren Weir believes it has another in it. It opened at $7 and has drifted out a half-point to $7.50. Gallante was game behind Jameka in the Naturalism and that form has been franked by Jameka’s Caulfield Cup win. The Robert Hickmott-trained gelding is on track for the Melbourne Cup and the Irish import is showing positive signs. It won the Sydney Cup in April and although Sydney Cup form can be a touch misleading, it should run well second up and it will handle this distance with ease. It opened at $4 and has drifted out a touch to $4.20. Who Shot Thebarman was scratched from the Geelong Cup for this much harder task which indicates that a good run is expected. The eight-year-old has lost its winning touch, but it has been finishing its races off nicely and bookmakers are respecting it at $3.75. It is unbeaten in two starts at this distance which is encouraging so include in selections. Excess Knowledge is a more than capable type which is nearing a big run. The Waterhouse/Bott-trained stayer finished off well behind Almandin in the Bart Cummings last start and another run at this distance will be ideal. It has form on slow tracks so consider for the win here. Hartnell has been in incredible form this season with three consecutive wins. Its last start win in the Group 1 Turnbull Stakes was outstanding as it defeated Jameka by 3.25 lengths and punters have been drawn to that effort. The 2040m at Moonee Valley is more like a 1600m race, but it won over 1600m in the Chelsmford Stakes by 7.8 lengths and it looks the obvious threat to the favourite at $3. Winx is an absolute superstar and punters were getting a gift when it was paying over $2 earlier in the week. The Chris Waller-trained champion is seeking back-to-back Cox Plate victories and it hasn’t put a foot wrong since this time last year. We can’t see it being beaten here and we predict a two-length victory. Punters are getting $2 now which is still a good price. Black Heart Bart did well to push Winx last start in a three-horse race and there’s no reason why it can’t run in the money here. The Darren Weir-trained runner has been in career-best form this season and the current price of $3.10 to place is incredible money. It’s a great Cox Plate field, but Black Heart Bart will put itself on the speed and fight hard. Harlow Gold has been well supported at $5 after its good run for fifth in the Thousand Guineas. The three-year-old will appreciate the rise in distance based on its breeding and it looks a great chance down in the weights at 55kg. It opened at $4.80 and has drifted out slightly. Whispering Brook produced a much-improved effort when third in the Thousand Guineas and punters should take notice. The Perth-trained filly wasn’t very impressive in its start prior at Caulfield, but it showed what it can produce last start and another top run looks likely. It has been bet into $6 and looks a winning hope. Prized Icon finished under a length behind Yankee Rose in the Spring Champion Stakes and that could be good form for this. The three-year-old colt is finding it hard to win a race since taking out the Champagne Stakes at Randwick in April, but it has talent and should be respected at $4.60.